American Pro Diving Center offers guided Crystal River dive and snorkel Manatee tours for over 18 years in florida. Our snorkel with manatee tours are guided by in water professional divemasters and is just one of the reasons we received many awards from state and local educational systems as well as the National Geographic Dive Center Award from PADI and National Geographic. Experience manatee tours with all the comforts that a five star facility has to offer in Crystal River, Florida. Snorkel with the Manatee success. Our trips are successful because the dive masters educate on the manatee and the manners of being in their environment while on the manatee snorkel tours. The guides enter the water with you so that both you and the Manatees have a safe and enjoyable time even if you are new to snorkeling. This can be the experience of a lifetime on our Crystal River manatee snorkel. What to do after your trip. Don't forget we offer more snorkeling and diving activities in the afternoon so your Florida vacation is truly enjoyed. People come from all over the world to see the manatee but miss seeing some of the Florida springs that are in our area. Imagine a fresh water spring that has over two hundred feet of visibility and the abundance of fish and turtles make for photo opportunities. Check out more snorkel tours and save on these afternoon trips just by Contact Us. Scuba Diving year round gives divers a dive destination unmatched by any other location in the world. Cavern spring diving and drift dives offer finds like fossils, shells, shark teeth and the water is crystal clear. Bring your digital camera or take an A.O.W. 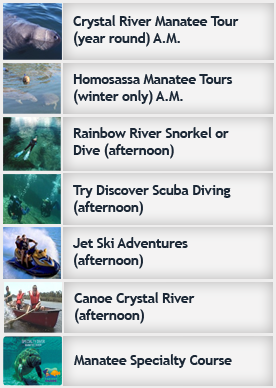 or Manatee specialty class and we offer 12 different guided dives to choose from and discount packages to save money. Whether you snorkel or dive the whole family can enjoy this vacation experience together.